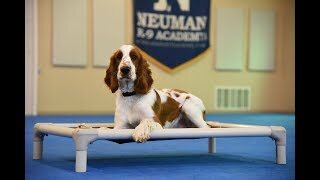 Wilson (Welsh Springer Spaniel) graduated from the dog training boot camp at Neuman K-9 Academy. This program included obedience commands to sit, stay, heel or walk on a loose leash, come when called, proper etiquette, no jumping up, meeting and greeting people under control, and running on a treadmill. Our dog training camp provides programs for Welsh Springer Spaniels such as boot camp, obedience training, and puppy camp.